SQL admin toolset 1.0 has the ability to multi-query, check passwords, analyze indexes and patches, edit and move jobs and gather server statistics. 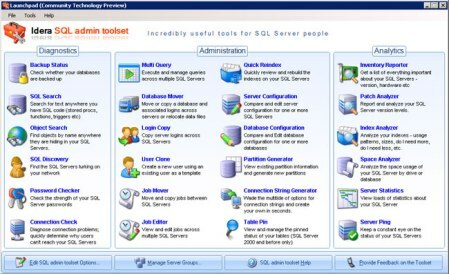 SQL admin toolset 1.0 is designed to give database administrators one desktop management console that has the ability to multi-query, check passwords, analyze indexes and patches, edit and move jobs and gather server statistics. 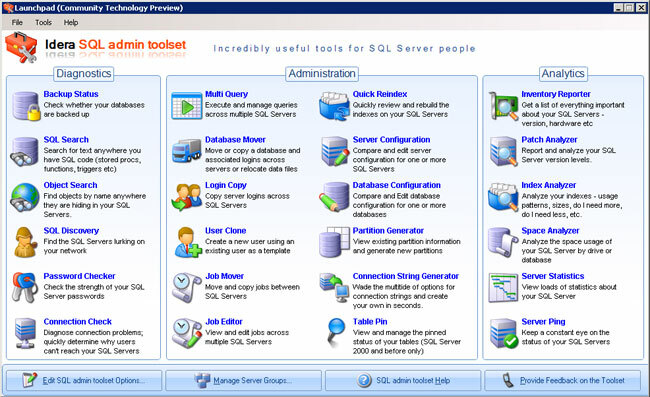 SQL admin toolset 1.0 includes a suite of 24 diagnostic, administration and analytical tools that give DBAs a view of their Microsoft SQL Server environment. Check whether databases are backed up. Search for text anywhere there is SQL code (stored procs, functions, triggers, etc.). Find objects by name anywhere in SQL Servers. Find hidden SQL Servers on the network. Check the strength of SQL Server passwords. Diagnose connection problems to determine why users can't reach SQL Servers. Execute and manage queries across multiple SQL Servers. Move or copy a database and associated logins across servers or relocate data files. Move and copy between servers. View and edit jobs across multiple SQL Servers. Compare and edit server configuration for one or more SQL Servers. Compare and edit database configuration for one or more databases. View existing partition information and generate new partitions. View the options for connection strings and create your own. View and manage the pinned status of tables. Get a list of important SQL Server data, including versions and hardware. Report and analyze on SQL Server version levels. Analyze indexes for usage patterns and sizes. Monitor the status of SQL Server. System requirements: CPU 2.0 GHz or higher. 32-bit OS: Windows 2000 Server SP4 or higher, Windows XP SP2 or later, Windows Vista Business or Enterprise. 64-bit OS: Windows Server 2003 SP1 (x64 or Itanium 2), Windows XP Professional (x64) software applications. .NET Framework 2.0, SQL Server 2000 SP4 or later, SQL Server 2005 SP1 or later, SQL Server 2008.